Happy Heart medical template embrace many healthcare spheres, particularly psychological counseling, dentistry equipments, pharmacy, pediatrics, ophthalmology, plastic surgery, weight loss, and other equipments. The template also boast with a clean layout that sets an ideal contrast together with catchy visuals and elements of vibrant hues, e.g. menu bars, call-to-action buttons, price tags, sale labels, etc. It comes with an elegant and an ultra responsive design and crossbrowser compatibility. Thus, your visitors will enjoy a great site's performance on any modern device and in any web browser. 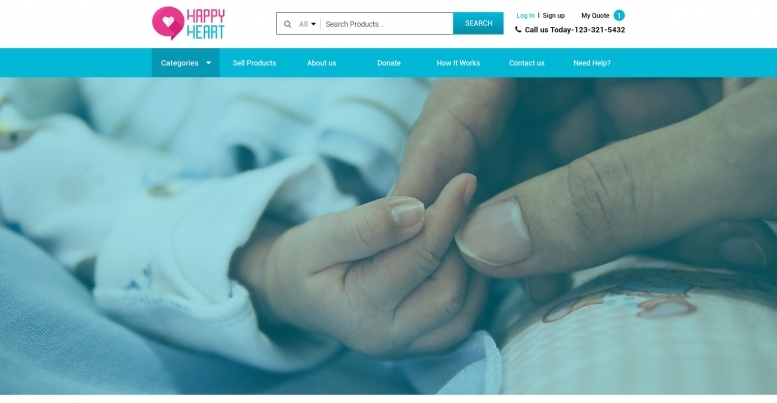 The home page of Happy Heart features an subtle banner slider along with a search in the header. Also the homepage have the sections of top and latest medical equipment, both separated by a How it Works Section. There is an appealing section to give information about your website. The footer of the template has a contact form so that the users can easily submit a query if they have any. $23.00 The simple license would allow you to use the template to create one website.